The 27th Annual North/South Tournament was nothing short of spectacular. White Dragon Judo Club represented in a huge way. The dojo by far had the largest number of competitors in this tournament. The club won 19 medals in this tournament and was represented well in the team competition. The South judo squad fell short again in the team competition and looked to next year to bring home the coveted North South team trophy that has eluded the team for years. The dynamic duo of Tiffany Polk and Derick Wellman dominated the kata competition again on their way to a gold medal finish. This team looks very promising and continues to improve in each tournament they compete in. The Juniors, coached by Tracy Hangley and current Masters champion Tara Kuhne, fought exceptionally well. There were a number of juniors who were competing for the first time. Though most of the newcomers were nervous and excited, they exceeded a lot of their coach’s expectations. Riley Singleton fought with great ferocity and determination. She got silver in her division but I would not be surprised if she wins gold in her next competition. Alivia Kirk and Issac Valdez-Soto won silver in their perspective divisions. These 3rd generation judokas displayed natural skill and athletic ability. 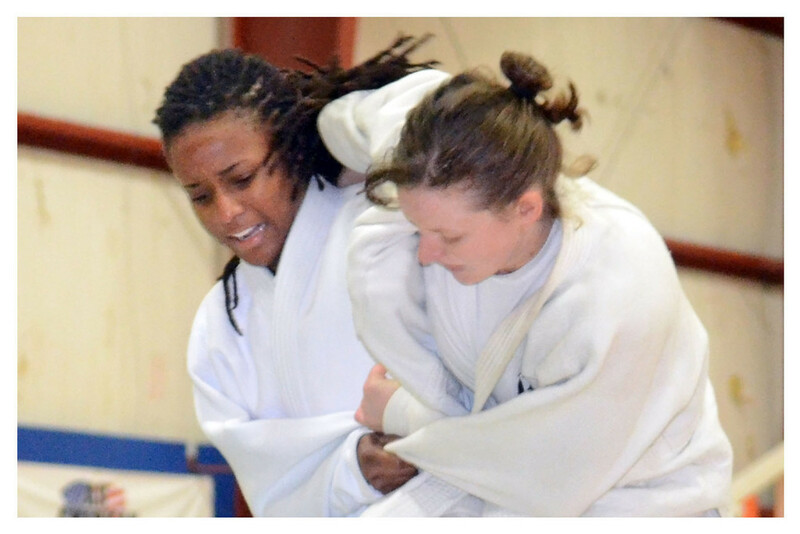 Alivia Kirk was selected to this year’s South judo squad in the team competition. Alex Johnson lost to golden score but manage to take bronze in his division. Ian Kuhne won most of his matches via pin but fell short in the gold medal match and had to settle for silver. Anthony Darevesky would not be denied in this tournament. After a startling upset at the Konjo Championships, Darevesky came to this tournament hungry for gold and with that the gold was his for the taking. Julia Greene was by far the most improved judoka of the tournament. She showed more control, desire, and technical competence. Her division was not easy, however she seem to handle the tough competition very well. She won her gold medal match by yuko score. Tom Kuhne saw vast improvement from his senior team. Eugene Hamilton went undefeated and was awarded the gold medal in his division. Tiffany Polk also competed in shiai. She did well going 3-0 on the day for a gold medal finish. Anna Feyina lost in the gold medal round and had to settle for silver. Larry Louis returned to the mat after a long hiatus. He fought in a different and a much lighter weight division and took bronze. Scott Frick sco red a bronze on the day as well. One of the bright stars of the day went to Jon Jones. In his first competition, Jon had to compete against judokas who were much wittier and highly skilled than himself. Jon’s heart and desire compensate for his lack of skill. He rose to the challenge and stole the gold from his much highly favored opponents. In the Masters Division, the current Master’s champ, Tara Kuhne fought to a 3-2 record on the day. Good enough to take silver. Tracy Hangley followed with a bronze medal finish. Matt Davis pulled in a silver medal in his weight class. After a disappointing bronze medal finish, Demonn Smith reeled off 3 consecutive victories by ippon in the open division to become this year’s Open Champion. Yes this year’s North South tournament was one for the ages. Next years tournament looks to be even better as there will be more competitors and more excitement. One thing is for sure, White Dragon Judo club will be in great attendance for this event. Tom Kuhne brought a team of judokas who had nothing on their mind but gold. 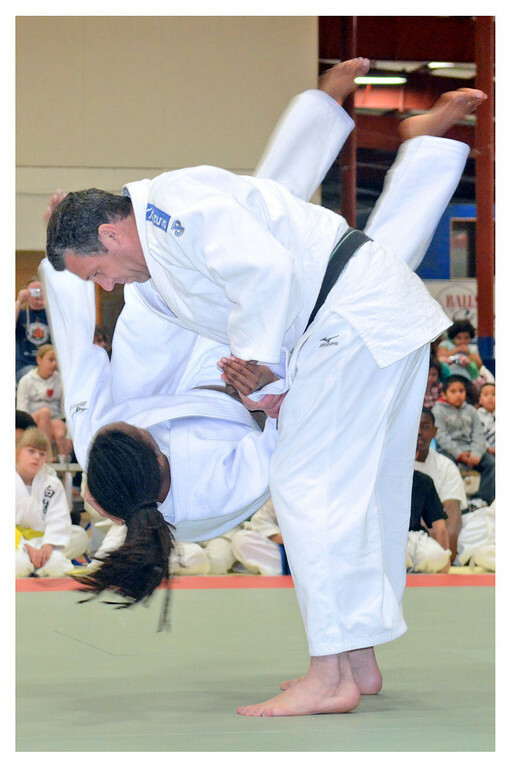 In the Kata competition, Derick Wellman and Tiffany Polk showed off exceptional precision and promise for next year. They engineered a fourth place finish amongst a large number of competitors. In Shiai, Anna Feygina lost her first match but managed to win in the repchage for fifth place. Eugene Hamilton lost a hard fought match in the preliminaries. Ryan Massey fought some tough competition on his way to bronze medal finish. The star of the day was Tara Kuhne. She went undefeated in her division to win the gold medal. It was a tournament filled with high level competition. Our White Dragon competitors rose to the occasion and delivered an impressive performance.